Dr. David Dalton has had a long and illustrious career in service to the viola as a performer, teacher, author, and arranger. In addition to being Professor Emeritus at Brigham Young University, he has served as American Viola Society JAVS Editor and President, and as International Viola Society President. He established the Primrose International Viola Archive in Provo, Utah. He has been the recipient of numerous awards, including the Maurice W. Riley Award for Distinguished Contributions to the Viola in Teaching, Scholarship, Composition, Philanthropy, or Service to the AVS. Dr. Dalton has an AVS competition named for him; the The David Dalton Viola Research Competition is held annually to encourage and support research among AVS student members. The Utah Viola Society recently paid tribute to Dr. Dalton at its recent Viola Day 2016. In addition to Dr. Dalton’s numerous achievements for the AVS and IVS, he also participated in co-founding the Utah Viola Society with Michael Palumbo. How did you come to play the viola? I didn’t convert fully to viola and give up violin and ‘burn my violin bridges’ until I was about 27 years old. I’d studied viola off and on as a side interest at Eastman. I got my Master’s Degree in Violin Performance and even performed the Jules Conus Concerto with the Eastman-Rochester Symphony, Howard Hanson conducting. After Primrose arrived, for a summer at Eastman, 1961, I gave up the violin with no regrets. One day I was invited by Mr. Primrose to watch him practice, he was preparing a recital at Eastman. I don’t recall if that was an unusual invitation or not. I sat with my jaw on the floor. His facility and bow arm—it was like watching a magic wand. I have to give credit to Francis Tursi. At Eastman, all violinists were required to play a semester of viola. I liked the viola class and wanted to stay in even though Mr. Tursi said I’d passed already. Mr Tursi would invite me to his office for a brownbag lunch, and after a month began encouraging me to audition for Rochester Philharmonic on viola. I hardly knew the clef and I felt like I could do it only if the tempo were no more than moderato! But I was flattered by Mr. Tursi; he had wonderful viola students and he must have seen something in me. What was a typical lesson with Primrose? I was always an advanced student, so I’m not sure what he would have done with less advanced students. He did teach by example. Especially in Japan with Dr. Suzuki at the gatherings he would play and demonstrate. My first lessons with him were in that summer of 1961 when he came to fill in for Francis Tursi. I played for Primrose, and after a few minutes because he said I needed a more sparkling left hand, he prescribed the famous Sevcik trill exercises. Otherwise we worked on repertoire—that’s what he was interested in. In the instances where he would be inspired and motivated to talk about technique, he was always very focused on the bow. He was fussy about the bow hold. He often would demonstrate the ‘round Ysaye bowing,’ string crossings under slurs in a round fashion which follows the contour of the bridge rather than stair-stepping. Most of technical work was a result of some difficulty in the repertoire. What was one thing that Mr. Primrose told you which has resonated the most with you or is indispensable to you? Is there one thing above all others that Mr. Primrose told you that you make sure to pass on to every student? Well, it’s his influence. He didn’t preach this, but Primrose devotes the opening chapter in the book (Playing the Viola) to the idea. I want students to learn about the viola so that they can gain respect and love for the instrument. That means they must know something about the major figures who contributed to the instrument. I want them to know a great deal about Primrose, so I prescribe these books (Playing the Viola and Walk on the North Side) to students, as well as the Tertis biography and the Yehudi Menuhin book. They need to know about Hindemith. I want to inculcate into them love and respect for the instrument. They don’t need to be apologetic, and I won’t tolerate anything that demeans the instrument or demeans anyone who has contributed to the growth of the instrument. What Primrose was trying to do was identify the instrument as something other than the dull dog of the string family. He did everything to make it a soloistic instrument, and he wanted to have violists be proud of the legacy and tradition that is there and has grown. I’ve been involved with AVS since 1975 and have attended many congresses and gatherings here and abroad; I’ve watched students through the years and heard competitions. The rise of viola technique has been exceptional. Even Joe DePasquale had said that he wouldn’t want to compete for an orchestra job these days. Students are often astonishing. 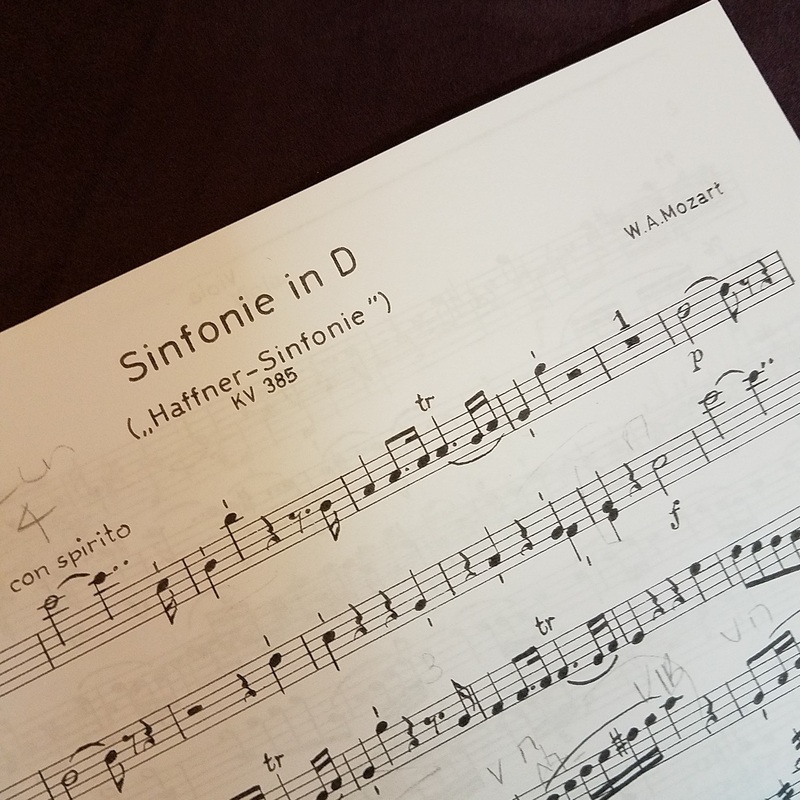 One of the questions on our list is “Who is your favorite violist?” Considering all the work you have done to preserve the legacy of William Primrose, it might be a silly question to ask you. But I’m going to ask anyway, “David Dalton, who is your favorite violist?” Primrose is obviously my favorite violist. Nobody really has the mixture of all he had that made him what he was. I’ve heard violists with absolutely gorgeous sounds, some with sterling and stunning technique, and some that played creatively and imaginatively, but the whole package that created Primrose I don’t quite find in one person. We once had a visiting violist at BYU and had a reception for them, and a guest asked “Tell me, what is a typical viola tone?” I pointed to three of my students standing nearby, and said “Go ask my students over there.” The guest came back and said, “I couldn’t get a clear answer!” It’s all about taste; if you prefer a mezzo sound, then you prefer Primrose. If you prefer darker tone, then you prefer Tertis. I once heard an LP record of the Five French Dances by Marais. It was a beautiful sound! It was Paul Doktor. It was very different from Primrose, but still wonderful. Sound to Sound to Sound…it’s all a matter of taste. But Primrose had a rare combination of assets. His upbringing and early influences as a teenager included Eugene Ysaye and Fritz Kreisler. They had such individual and unmistakable stamps, and Primrose is in that category. That being said, I have enormous respect for so many violists today, and would hate to start naming them because I don’t want to leave any of them out! Do you have one favorite viola recording? It’s Primrose’s recording of the Kreisler arrangement of “Songs my Mother taught me” by Dvorak—so wonderfully warm, I get teary-eyed when I hear it. What is your favorite piece of viola repertoire to perform or to teach? The Bax Sonata is close to my heart. I love to teach it. I love both the Bartok Concerto and the Walton Concerto. The Walton concerto was one of the influences that started stirring me towards the viola. At Eastman, I was walking down the hall where the practice rooms were and I heard a bewitching melody that stopped me in my tracks, so the opening phrase of the Walton concerto is part of my ‘conversion story.’ I thoroughly enjoy the Bloch 1919 Suite; it seems like it has everything you want to do on the viola. I relished both playing it and teaching it. Hindemith is a different love affair than Walton, but the Opus 11 #4 Sonata is a favorite. There is another sonata that I don’t understand why it’s not played more, and that is Hindemith’s Opus 25 #4 Sonata for Viola and Piano. It has virtuosic licks and is a wonderful work. Some works that are never played that have great, great merit, and truthfully I’m tired of Shostakovich and Brahms Sonatas, but if someone would please give me William Bergsma Fantastic Variations on a Theme from Tristan I would sit up and take notice. It was composed for Primrose. It has strong merit and is seldom played. And because pieces are seldom played, nobody knows them, and then they’re even less frequently played, and then completely forgotten. The Zeyringer (Zeyringer Literature for Viola) has so many concertos, why do we only play three? In your life, you’ve certainly had the opportunity to play many different violas. What was your favorite viola that you’ve ever played? What was your favorite that you’ve owned? What advice do you have for people searching for their perfect viola? As a student at Eastman I had the loan of a viola from a violin teacher. Later I listened to recordings of a recital I had performed, and it was the most satisfying sound of anything I’d owned. It was a no name instrument; it was older. I don’t know the maker, and I didn’t realize how good it was until I had to give it back. I once bought an instrument while visiting Los Angeles. I was immediately seduced by it—it was so gorgeous. I took it into a room at the shop and played it for a while. I thought it sounded great in that room and so I decided to buy it. I went back to Bloomington, and started playing it. I thought that it wasn’t the same instrument that I had bought, it had such a different sound! I had to sell it, it just didn’t sound the same as it had in the room at the shop. Primrose, at the behest of Joe dePasquale, had (Sergio) Peresson make him a viola. I bought that viola from Primrose. It was quite a good instrument, but I thought it wasn’t quite what I wanted, so I looked for deeper sonority and sold the Peresson. Then at 1983 Viola Congress in Houston, I heard Wayne Crouse perform, and he announced that he’d recently bought a viola which he called “the Ex-Primrose Peresson.” It was the same viola that I had owned, and I thought it sounded pretty good! A few years ago, I was in Cleveland to do a Primrose presentation. Jeffrey Irvine invited us to a faculty recital at Cleveland Institute performed by Mark Jackobs. We went to the recital, and afterwards I complimented him and his very lovely sounding viola. He then showed me the viola which I recognized as the “Ex-Primrose, ex-Wayne Crouse, ex-David Dalton” viola. That was the viola that I had sold, and I thought “How stupid!” I later purchased a Peresson viola which proved to be too big. I’ve owned two (Lawrence) Furse violas. Most of my students either play Furse or Paul Hart violas, both Utah makers. One piece of advice for students looking for violas: There are so many local luthiers in Utah, don’t ignore them. Don’t expect a quick fix, it takes time and deliberation to find the right instrument. And don’t become seduced by the looks of a viola! If you could offer one piece of advice to up and coming young violists, what would it be? It’s so important—do everything you can to get a good teacher. Yes, one has to consider matters of distance and money, but a student must be well-founded in technique. It can take years of remedial work if a student doesn’t have a good foundation. If you could offer one piece of advice to violists who are in the middle of their careers, what would it be? Thinking of my daughter, (Alison Dalton, a violinist in the Chicago symphony) she’s spent 30 years in Chicago symphony and she’s done very well in keeping up her technique. She’s sought opportunities to perform in public and show her skills. It’s very important to not become diverted from building technical and musical skills that are in the repertoire. Try to find musical fulfilment outside one’s job. Teaching can be an outlet, or a chamber music group, or preparing a concerto to perform with orchestra. You’ve had so many different aspects of your career, including teaching, playing, editing, writing; which was the most fun for you? Don’t forget that I also conducted the Salt Lake Symphony for a dozen years, and conducted at BYU. I conducted opera including Falstaff and Jenufa. I was a founding member of Deseret String Quartet, the faculty chamber music group at BYU. We were together almost 30 years. It evolved into Deseret Piano Quartet, and it was a very compatible group. We performed a concert every semester from 1970 on. I coached chamber music at BYU, and in the summers, I would go to San Diego and Ashland, Oregon to coach at chamber music workshops. It was really fun. Ashland was mostly amateurs who could play well, but had varied backgrounds. They were doctors, lawyers, etc. They had one dynamic level, and that was forte! But the people had such a devotion to chamber music, they dove deep into the repertoire, and would discuss pieces I didn’t even knew existed. I have to give BYU a lot of credit because they allowed me to diversify. But to pick out one thing? When I was teaching, then I didn’t want to do other AVS stuff. If I was steeped in writing, then I didn’t want to put it aside to go teach. I enjoyed what I was doing when I was doing it. I enjoyed diversifying, and I enjoyed all aspects of all the things that I was called upon or volunteered to do. You have received so many awards and honors, some from American Viola Society, some from IVS, some from BYU. Of all the many honors that you have received, which has been the most meaningful to you? The IVS Golden Alto Clef is the top. I was greatly honored by that. It’s an honor that comes from one’s colleagues, one’s peers—an honor they bestowed upon me. The other two meaningful honors are when I was elected President of American Viola Society, and when I was elected President of International Viola Society. That was the first time that anyone outside the German speaking realm had been elected President of IVS. 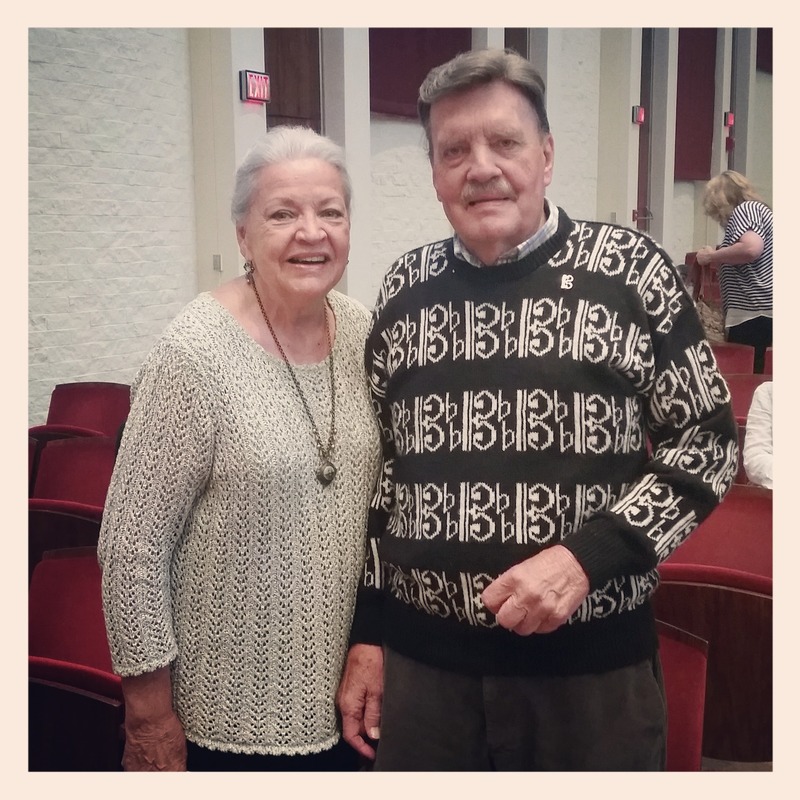 David and Donna Dalton at Oberlin College for the American Viola Society Festival, 2016. David is wearing is famous Alto Clef Sweater. We are all jealous. One of your former students recently said about you, “If David asks you to do something, you do it!” How does one get to be such an inspiring teacher, one whose students play and perform at such a high level, and who inspires such deep love and respect from his students? I’ve had my share of good students, and they gave me a great deal of pleasure. I liked them personally and they were an enrichment to my career. I don’t think I was too draconian, but I think it was Claudine (Bigelow) who said that it took her two years to discover that I was only kidding! I have a rather intimidating aspect, not a warm, gregarious ‘love ‘em all the time’ type. My personality is more subtle, I guess. Until they catch on, they’re in a mode of intimidation, but once they find out it’s like letting a bird out of a cage. Then they come to the lesson without dread and fear and life becomes a lot better! 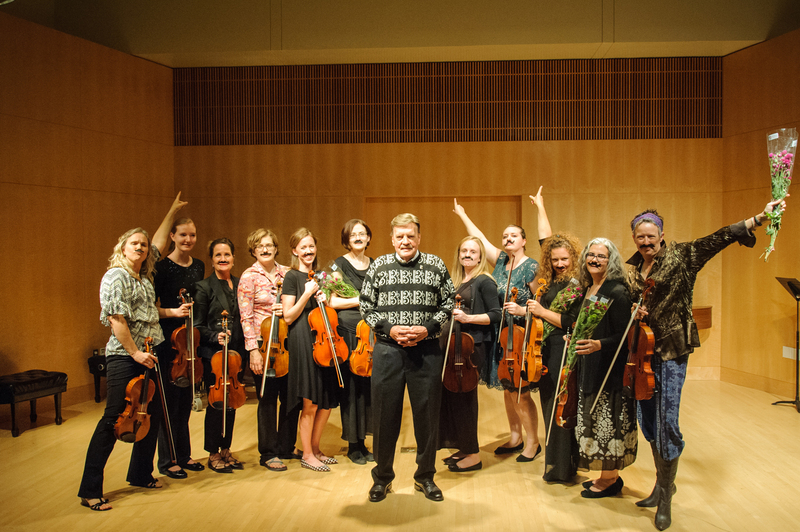 David Dalton with students who performed for Utah Viola Society’s Viola Day 2016. Have you ever wondered what it takes to win an audition? Do you struggle with your Mendelssohn Scherzo excerpt? Do you have an audition on the horizon, or just trying to keep up your audition chops? Then join the Utah Viola Society for our Audition Seminar on Saturday, November 12! We have a wonderful panel of Utah Symphony members including Utah Symphony viola section members Joel Gibbs, Whittney Thomas, and Associate Concertmaster Ralph Matson ready to assist you with all things audition! If you’d like to perform, please contact Brad Ottesen. Anyone is welcome, and if you’re not in the mood to play Don Juan, please feel free to come listen and learn!